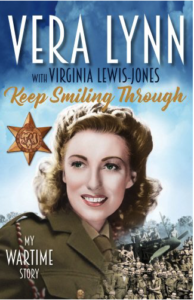 This book tells her story but also the story of many of the servicemen who met her and heard her sing. They were in many cases highly charged, emotional moments, as troops came away from ferocious fighting in the malaria-ridden jungle to hear a beautiful female voice from home sing messages that felt to them had been sent directly from their wives, sweethearts and mothers. Vera not only sang, but chatted to the soldiers and toured makeshift hospital wards, speaking to men who were very badly wounded and in a lot of pain. It is no exaggeration to say that in many cases they regarded her as an angel. As well as the personal stories, the book also gives a lot of background to the wider campaign in Burma and tells the story of how the fortunes of the Fourteenth army were transformed under the legendary, straight-talking, square-jawed, soldier’s soldier, General ‘Bill’ Slim. At the time of writing, Vera is the best-selling female artist of 2017 in terms of album sales; wouldn’t it be an amazing thing if she could top the charts for both music and books in her centenary year?